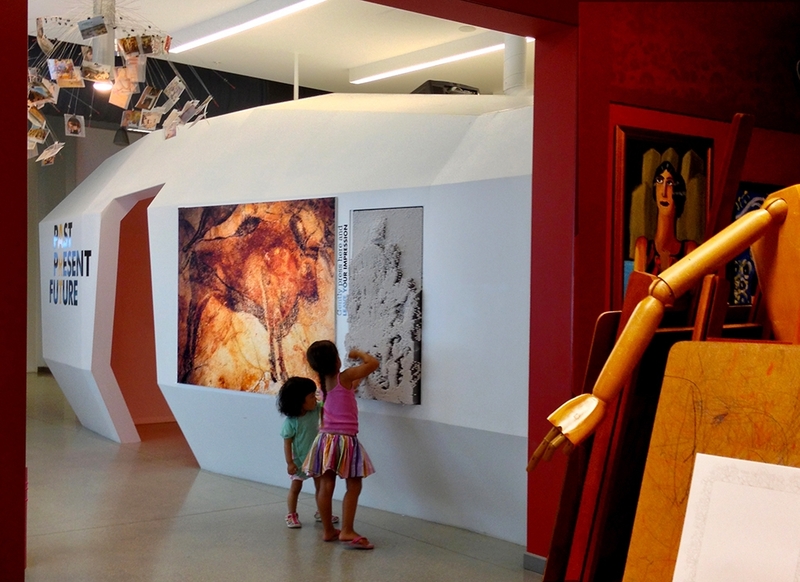 The Cave is the intriguing portal to Young At Art Museum, an innovative and sophisticated museum bridging art and exploration. Spanning the entry as the first spatial encounter, the Cave’s architectural and iconic presence welcomes visitors to explorative art-making and social engagement. The column-free wood structure is faceted and clad with super white matte surfacing, designed to express mystery and discovery, enclosure and aperture, the ancient and the new. Drawn inside the intimate 250SF interior, visitors make their mark analogous to early cave painting, using body-sized pin-presses or Etch A Sketches and inscribing foil wall panels. An artist-commissioned video supercharges the cave into an immersive 4-D flipbook of flashing imagery and dynamic shifts of color with an explosive score that positions young artists into the continuum of art history. The pavilion is open on both sides for accessibility and security. Within shallow walls, networked low-heat, programmable LED’s are vivid in the openness and safe when touched. As orientation theatre, the Cave is an educational experience that provides an introduction to critical thinking. Within this powerful portal, projected imagery flashes, morphs and lingers – 5000 years of art’s histories are shown in chronological order, ending with the inhabitants of the cave displayed as the lasting image of the timeline. 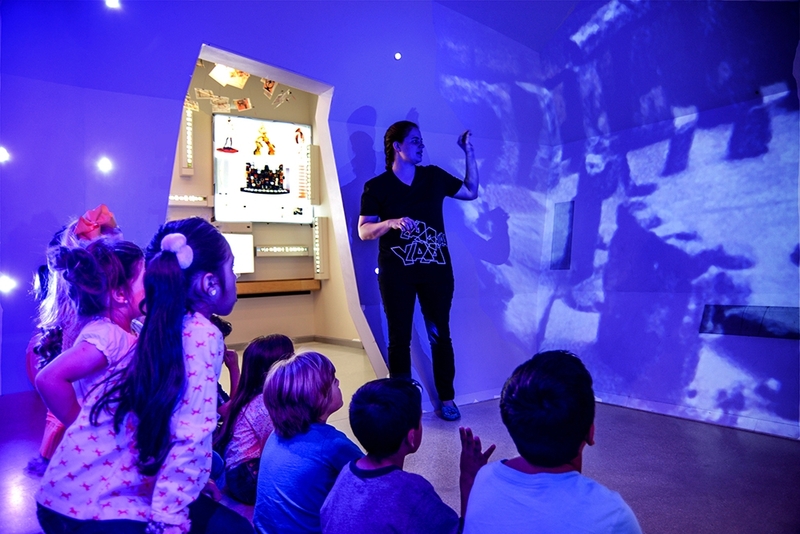 The museum’s education team, director, design team, commissioning agent, and the Cave artist collaborated closely to produce a video that serves as an educational discovery tool, in a paradigm-shift of learning about art to using art for learning. 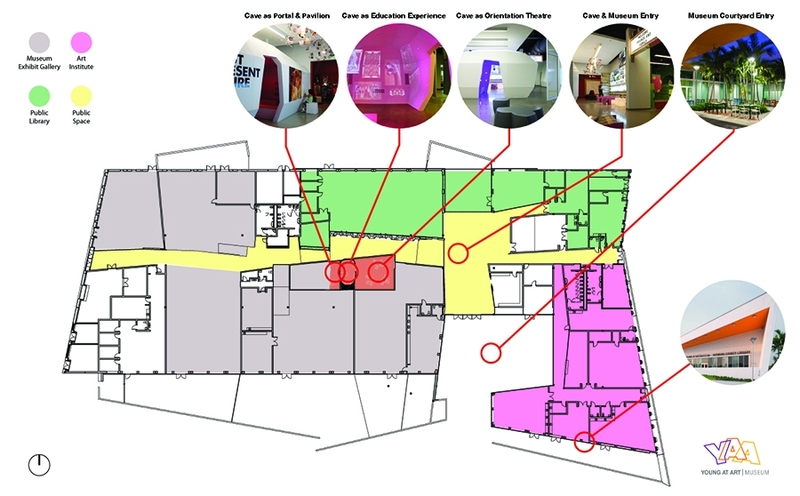 The Cave – crisp and chiseled, communicative and cacophonous – transforms the ubiquitous museum orientation gallery into branded experience and engaging public space, serving as metaphor, meeting place, orientation theatre, art-making pavilion and mini-classroom for visitors of all ages.